Local composer and researcher Julian Brooks attended the New Voices networking days at Heritage Quay in autumn 2017. As part of the days, the composers explored part of the British Music Collection and Julian was excited by the score for Trevor Wishart and Mick Banks’ ambitious site specific music composition “Landscape”, which was first staged in 1970. This chance encounter with the score led to a recreation of the spectacular all day event around Hebden Bridge featuring fireworks, choirs on hillsides, flags, balloons, bells, improvising kids, cyclists playing their bikes and cones of black ice cream served from Royds ice cream vans playing Beethoven’s 7th Symphony. Julian worked with Leeds-born Trevor himself, who is regarded, amongst many accolades, as the UK father of community music in this country. The event was supported by UK contemporary music charity Sound and Music, Arts Council England and Hebden Bridge Arts Festival. Julian made use of Mick and Trevor’s guidance to incorporate workshops and performances from musicians, artists, local schools, community groups and small business introducing audiences to contemporary music that will appeal to new and experienced audiences alike. During 2012-2017 the University of Huddersfield archive service was transformed with just under £2million investment from the Heritage Lottery Fund and the University of Huddersfield. The project funded new premises in Heritage Quay, plus extensive engagement, participation and collections management programmes. The service has won a range of external awards during this period including the Times Higher Education Leadership & Management Award for libraries and the Guardian HE award for “buildings that inspire”, as well as obtaining Archive Service Accreditation. The project evaluation report, which follows HLF’s latest guidance, has just been published at http://eprints.hud.ac.uk/id/eprint/34679/ and is now freely available to download. We’re having some difficulties updating the site at the moment, but we’d like to inform any potential users of the research room that we will be closed to the public next week (Monday 30th and Tuesday 31st July) for our annual stock take. We will be open again week commencing 6 August. The public tour on the 1st August at 1pm will take place as usual. Archivists are careful to record as much information as possible on the sources of new material arriving, as knowing the provenance of records or rare books adds to our understanding of them. Knowing exactly who created and used particular records gives us insights into how those people worked and what they might have thought. Knowing where a collection has come from helps us to decide how much to trust a particular historical source. It can also help us decide how relevant a particular record series might be for our research. A series of photographs of a business’ premises taken by the marketing department is going to show different things than a series of photos taken by an individual employee on her retirement, for example. However, sometimes things turn up that have been in an archive for years, but not yet documented. Perhaps they were mislabelled or housed with other things before there was an archivist to catalogue them! 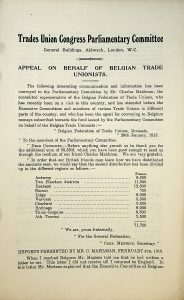 One such little collection that turned up in our move to Heritage Quay was a group of reports relating to trade unionism. These have just been catalogued and are now available to use in our searchroom. 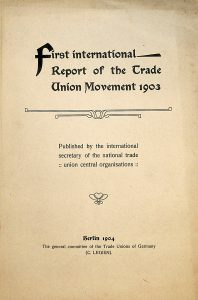 The reports fall into three series: Report of the Annual Trades Union Congress (TUC) 1916-1969, Reports by the Parliamentary Committee of the Trades Union Congress (1906-1918), and International Report of the Trade Union Movement (1903-1911). The first step was to check for signs of where these reports might have come from and how they came to us. Several issues were stamped Huddersfield College of Technology or had the College’s bookplate pasted into the cover. The reports therefore belonged with the Institutional Library: publications that used to be part of the University of Huddersfield’s main library and have been kept as Special Collections. They would have been acquired for the use of staff and students researching and studying here in the past. Obviously given the size of the University of Huddersfield’s library, and its history dating back to its days as the Huddersfield Mechanics Institution in the Victorian era, we can’t keep a copy of every book or report our library every held! So how do we decide what to keep? The ‘new’ reports add to our political collections, including the archive of the Huddersfield Labour Party, the papers of Sir Joseph Mallalieu MP, and the library of famous statistician G.H. Wood. There were already a number of other left-wing serial publications catalogued within the Institutional Library, such as ‘Labour Weekly’ and ‘Labour Research’, so the provenance made sense. These links to our other collections were part of the reason for deciding to keep these reports. We also look for how rare items seem to be. Searches of the COPAC library catalogue showed that 12 university libraries in the UK hold printed copies of the Report of the Annual Trades Union Congress. Not all of these hold complete series. The TUC has digitised their holdings and made them available online. The International Report is much rarer: WorldCat shows only 17 libraries holding copies worldwide, none of them in the UK. This might reflect its being published in Germany, not long before the First World War. Another consideration we take into account when deciding which publications to keep is the potential usefulness to researchers. As Huddersfield’s political history is one of our collecting areas, we attract historians, students, local people and other users wanting to know more. These reports will certainly be of interest. Many of the reports date from the First World War, and cover issues such as assisting Belgian refugees. With lots of research still being generated in the centenary of the war, and plenty of interest in politics, economics and social history the reports certainly have the potential to be great source material for a range of users now and in years to come. This month saw the launch of a new exhibition at Heritage Quay: ‘Ted Hughes: You Are Who You Choose To Be’ which runs until the beginning of July. Like many of the displays we have in the archives, this exhibition wasn’t curated by us. This time we worked with staff in the English Literature department here at the University. Between us we supported Third Year English Literature students to select archival documents and objects that explore the Yorkshire roots of Hughes’s work, as well as his family life and professional collaborators. The displays include many newer additions to the archives here at Heritage Quay, including the Ted Hughes Network archive and the Donald Crossley archive both of which are available to researchers, although not fully catalogued yet. There are also some items on loan from a private collector. The process of working on the exhibition with the students was really interesting. As any gallery or museum curator will tell you, curation (both selection of objects and text writing) is a delicate art. There are plenty of decisions to be made from the story you’d like to tell, to the depth of description. There will be physical constraints to deal with, including the need to minimise any damage to the objects on show, and the amount of display space available. Our students came along for a teaching session with Public Engagement Office David Smith, who presented the relevant archives and rare books to the group, and gave them an introduction to curating an exhibition. The students were then divided into groups and had the opportunity to come and get to know the collections better in our Searchroom. These research sessions produced plenty of animated discussion! Each group came up with proposals for each of our six cases, with tutors choosing the best ideas to become the final exhibition. The students then worked together to produce the finished layout and captions. The new exhibition was then officially launched as part of the Huddersfield Literature Festival, complete with a reading of the poem ‘Six Young Men’ by Huddersfield’s own David Rudrum, and a comedy set from poet, comedian, actor and director, Owen O’Neill. We are delighted with the final exhibition, and have been receiving really positive responses from our visitors. We’re just as pleased to have had the chance to take some of our students through the whole process of creating an exhibition, from brainstorming ideas to launch party! Early January tends to be a quiet time in the searchroom – are all you researchers recovering from the holiday period? So the team took the opportunity this year to focus on some larger collections which are difficult to work on whilst the searchroom is open and our normal activities are going on. During January this year the team finished off the Hopkinsons’ Ltd archive and made a start on sorting and surveying Sir Patrick Stewart’s archive, received during 2017.